Aziz Ansari has a wide range of pop culture references in that hilarious brain of his. And his Netflix series Master of None benefits from his blend of quirky and mainstream mentions. So when the Jabbawockeez show up on Master of None Season 2 as performers on the reality baking show that Dev hosts, Clash of the Cupcakes, it’s a delight for fans of the dance crew. 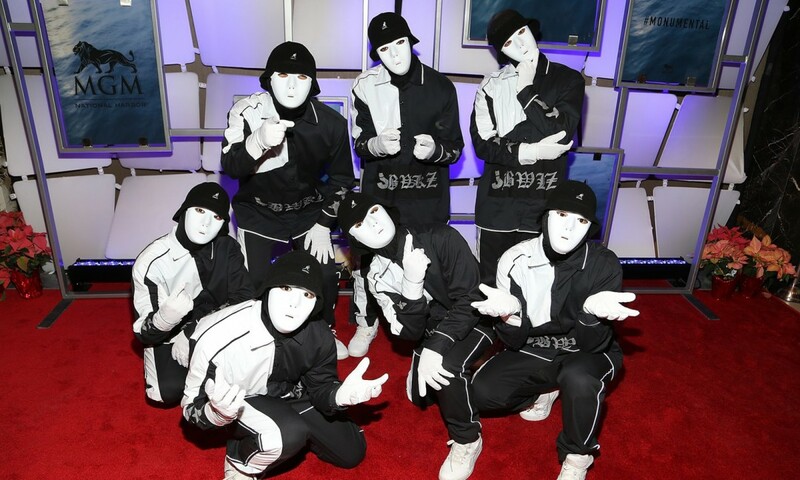 But if you aren’t familiar with these masked men, you may be wondering who the Jabbawockeez are. Let’s travel back in time to when George W. Bush was president, the writers strike was impacting television programming, and the Jabbawockeez were mesmerizing people with their awesome dance moves on TV on a weekly basis. The year was 2008, the host was Mario Lopez, and the channel was MTV. America’s Best Dance Crew was the newest dance reality competition series and the breakout stars were none other than the Jabbawockeez. The masked dancers from San Diego, California started their dance troupe in 2003, but they became celebrities in 2008 since they were by far the most memorable crew on Season 1 of ABDC. Sure, that was in large part because of their masks, but their signature white masks aren’t just a gimmick. The freaky costume choice not only makes them stand out, but it actually allows the focus to be on each of the dancer’s unique moves. Plus, the dancers aren’t as scary as the masks might make them seem since their performances typically include some lighthearted elements that showcase the dance crew’s sense of humor. After all, their name indicates their fun spirit since Jabbawockeez is a play on the Lewis Carroll nonsense poem “Jabberwocky” that was in Through the Looking-Glass, the sequel to Alice’s Adventures in Wonderland. Yet beyond their fun energy, the Jabbawockeez are incredibly impressive as they incorporate articulate and innovative moves into their choreography. So it was no wonder that this dance group ended up winning the very first season of ABDC. Their time on America’s Best Dance Crew brought them worldwide fame with many notable performances following. Along with doing three Las Vegas residencies since 2008, they toured with New Kids on the Block, were featured on Ashley Hebert’s season of The Bachelorette, and danced with Taylor Swift during her performance of “22” at the 2013 Billboard Music Awards. Nowadays they are performing their residency show, JREAMZ: Journey Within, at the MGM Grand Las Vegas. And, of course, they made some time to hang out with Ansari during Season 2 of Master of None. This lovable dance crew is worth knowing and if you somehow missed their existence, Master of None may have just added to their fanbase. And if you want to know more about how the men behind the masks, the Jabbawockeez even made their own TV show in 2016, The Movement on go90, that you can watch on YouTube. While the Jabbawockeez aren’t performing on Master of None‘s fictional reality show Clash of the Cupcakes in real life, they are keeping busy with their badass moves and will continue to entertain people with their on stage antics for years to come.